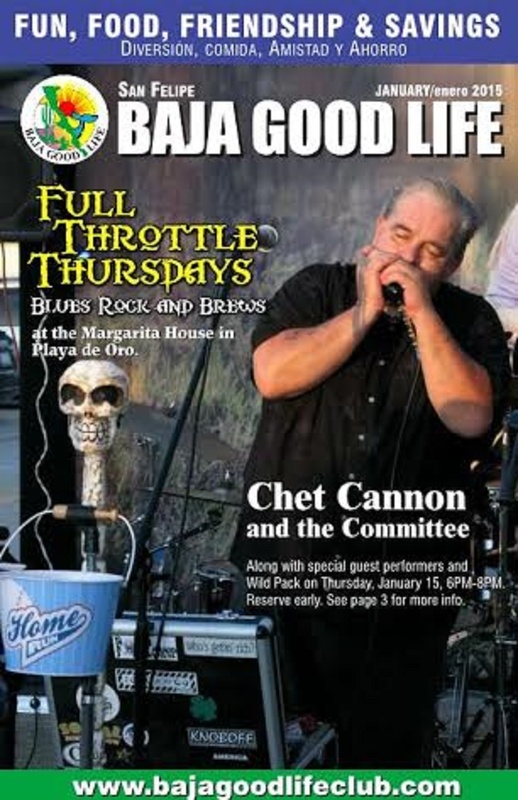 Full Throttle Thursday with CHET CANNON and the Committee hosted by WILD PACK! Time: 6:00 pm - ???? Cost: TICKETS ONLY $80mn! BUY NOW, come to the office, or 686-230-9933. Dinner Special: 3 Tacos with Beans and Rice ONLY $75mn. Win FREE Beer * Have a Good Time * Rock the Margarita House! Chet Cannon is a self-described “terminal blues fan” who once attended 26 blues concerts in 29 days. “We’ve been playing the blues as the Committee around San Diego since the summer of 2001,” says Cannon. “I’m happy to say we’ve had the opportunity to share a stage with some very talented musicians, opening for Candye Kane, John Hammond, Rod Piazza and the Mighty Flyers, Chris Cain, Little Charlie and the Nightcats, Maria Muldaur, Magic Slim's Teardrops, and others. “We pour our heart into every performance. Our main objective is to make sure it’s a good time.” The band’s Don’t Get Me Started! CD was SDMA-nominated in 2006 for Best Blues Album.